Wynn Resorts sent the memo to the Massachusetts Gaming Commission prior to the Boston Herald learning of its existence. Wynn Resorts released a memo to the Boston Herald which claimed the Las Vegas casino company has undergone a “complete transformation” over the past year. The memo, published just days before a Massachusetts Gaming Commission hearing into Wynn’s license status, claims that the executives who ignored former CEO Steve Wynn’s misconduct have all “been removed” from the company. The document makes several points in favor of Wynn Resorts, which are likely to be talking points when company executives appear before the Gaming Commission on April 1. When the executives meet with the commissioners in the April 1 public hearing (paywall), it will be less than three months until the Encore Boston Harbor is slated to open. Management for Encore Boston Harbor is holding a series of job fairs in which the company expects to hire around 5,800 workers. The fear is the MGC pulls the Encore Boston Harbor license, putting at risk thousands of jobs in the area. For that reason, the consensus is Wynn Resorts faces fines and censure, but not the loss of its casino license. Wynn’s leaders say they formed an independent committee to investigate who knew about sexual assault allegations made about Steve Wynn. The same committee probed what was done in response to the allegations and whether sexual harassment was a “systemic issue“. The memo asserts that Wynn Resorts has remade its board of directors and executive management team. In one potential point of concern, it acknowledged that the only executive remaining from the Steve Wynn era was Matthew Maddow, the current Wynn chief executive. Wynn Resorts says it has instituted several high-level changes to the corporate culture. A new policy, called the “Preventing Harassment and Discrimination Policy”, applies to all company employees, including the board of directors. All employees also have to attend sexual harassment training courses, as well. Michael Weaver, a Wynn spokesman, confirmed to the Boston Herald that the memo was filed with Massachusetts regulators. Weaver otherwise declined to discuss the Encore Boston Harbor licensing process. It is clear the April 1 hearing before the MGC will be pivotal in the licensing process, because it is so near to the projected June grand opening. Wynn’s actions come during a yearlong period in which the Massachusetts Gaming Commission has probed the board’s conduct. Last month, the Nevada Gaming Commission issued a $20 million fine against Wynn Resorts — three times the previous record fine — for its failure to rein in Steve Wynn’s alleged misconduct. Wynn Resorts and the Nevada Gaming Commission have a longstanding relationship, the kind of link that does not exist with Massachusetts commissioners. In short, Wynn is testing the limits of patience from regulators whom they have not yet collected a penny in tax revenues and from whom they hardly knew prior to five years ago. One action the company took to build relationships with Massachusetts officials is to hire former Boston Police Commissioner Ed Davis to institute a “compliance program” at Wynn. Commissioner Davis will “review all claims of sexual harassment reported by employees”, a role that is meant to assure MGC regulators that a known and respected individual will assure compliance in the future. Already, the company bowed to local pressure to take Steve Wynn’s name off the $2.4 billion integrated casino resort being built in the Boston suburb of Everett. 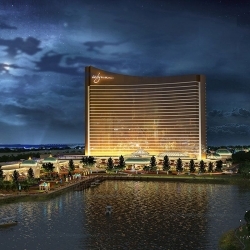 Originally named the Wynn Boston Harbor, company executives renamed the resort the Encore Boston Harbor in April 2018. “Encore” is the brand name of resorts associated with Wynn properties around the globe — often built in a second phase of expansion.